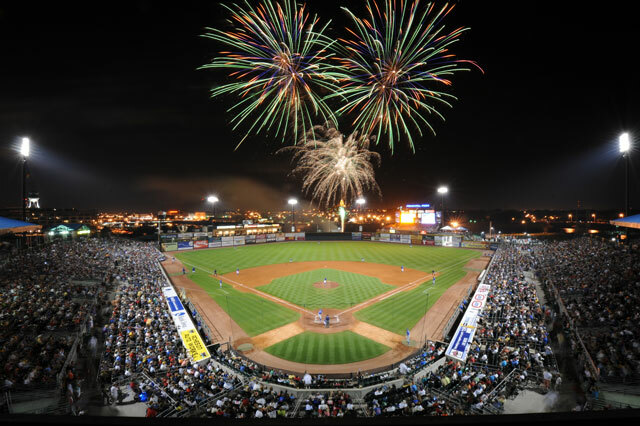 For fans and players, Principal Park offers one of the top stadium experiences in all of minor league baseball. Principal Park sits at the confluence of the Des Moines and Raccoon Rivers, offers spectacular views of the Iowa State Capitol and downtown Des Moines, and features a first-class playing surface. Principal Park opened prior to the 1992 season and features 11,500 seats, 45 skyboxes, four picnic areas, a kids play area, a fountain in the right field corner, and the Cub Club Restaurant in left field. The original stadium in Des Moines was built on the current site in 1947 and was called Pioneer Park. In 1959, the name was changed to Sec Taylor Stadium in honor of former Des Moines Register and Tribune sports editor Garner W. (Sec) Taylor. The Principal Financial Group purchased the naming rights to the stadium during the 2004 season. The Sec Taylor name remains attached to the stadium's playing field. Planning for a new stadium began in August, 1988 leading up to the demolition of the old stadium on Sept. 10, 1991. The $12 million rebuilding effort began on the old site in October. The first game in the new stadium was played on April 16, 1992. In 1995, the ballpark added a new look with a remodeled clubhouse and 12 skyboxes in left field. The $2 million clubhouse expansion featured new locker room facilities for both the Cubs and visiting teams. The clubhouse complex also included: new offices for the manager and coaches, laundry and storage facilities, an expanded training room, an indoor batting cage, a weight room, and family lounge. Many new features were added prior to the 2000 season. Eighty-eight new Home Plate Club seats were constructed between the dugouts, a $100,000 sound system was installed, the Cub Club was remodeled, and Principal Park became a smoke-free facility. After the completion of the 2002 season, a new playing surface was installed at Principal Park. The project took three months to complete and cost just under one million dollars. The field features the same type of grass as Wrigley Field in Chicago and is one of the best playing fields in the minor leagues. During the winter between the 2005 and 2006 seasons, Principal Park underwent an extensive renovation at a cost of $6.8 million. New seats were installed throughout the ballpark, a new scoreboard and videoboard were installed. Prior to the 2007 season, the fountain in right field was installed, a bleacher section was added in front of the scoreboard, and a giant kids' play area was installed in the first base side of the concourse. The clubhouse facilities were upgraded again prior to the 2013 season. The locker, shower, and restroom areas in both the home and visiting clubhouses were expanded along with the Cubs' fitness room. The indoor batting cage will also be expanded during the million dollar renovation project. In 2015 astate-of-the-art HD Daktronics video board was installed above the bleachers in right field. The new unit replaced the previous right field structure and measures 64 feet wide by 24 feet tall. Also, the Principal Park grounds crew installed a whole new playing surface prior to the 2015 campaign comprised of 265 tons of sand and two-and-a-half acres of sod from a Colorado sod farm. Finally, a brand new elevator was installed inside the west entrance. Prior to the 2016 season, the backstop netting was extended to the far ends of each dugout to increase the safety of fans. Poles were burried 30 feet underground outside of the left and right field walls to support the heavy netting. In total, the project cost around $100,000. The Cubs were the first team in the Pacific Coast League to announce the netting extension and were pioneers of Major League Baseball's recommendation that each park follow suit by 2017. Additions to Principal Park in 2017 included a new HD ribbon video board atop the left field sweets and state-of-the-art LED lighting from Musco. Both were geared toward enhancing fan and player experience by providing more stats and information on the video board, and providing better viewing of the playing field with brighter lights. The lights are also energy efficient and have the ability to "dance" to music. Ground broke in October of 2017 on a new batting cage, to be constructed beyond the left field wall. The new cage will be used in addition to the existing batting cage in the home clubhouse and aims to improve Principal Park's facilities for player development. In 1992 and 2009, the Cubs were honored by Baseball America magazine with the Bob Freitas Award, which recognizes the top minor league team in each classification. In 1992, the Cubs were also named the top tourist attraction in the state by the Iowa Tourism Council. In 1996 and 1998, Baseball America ranked Principal Park as one of the best minor league ballparks in the country and the stadium with the best view. In 2010, Head Groundskeeper Chris Schlosser was recognized with the Pacific Coast League Sports Turf Manager of the Year Award. Chris and his staff are annually rated among the best in the league in the annual survey of PCL field managers. In 2014, President and General Manager Sam Bernabe was named Baseball America Minor League Executive of the Year. Bernabe was presented with the award at the Baseball Winter Meetings in San Diego in December. The award came in Bernabe's 31st season with the organization. During the 1993 and 2008 seasons, Principal Park was surrounded by flood waters. The Cubs helped Des Moines recover from the July, 1993 flooding that shut down the water treatment plant by going on to win the American Association championship that season. One June 14, 2008, the Cubs had to host the Nashville Sounds in a game with an actual attendance of "0" due to an evacuation order in downtown Des Moines. Principal Park hosted the Triple-A All-Star Game in 1997. The game drew 11,183 fans and marked the final Triple-A All-Star Game that divided the players into American League and National League teams based on their affiliates. The AL won the game 5-3 and the "Star of Stars" winners were Frank Catalanotto (IL-Toledo), Nate Minchey (PCL-Colorado Springs), and Magglio Ordonez (AA-Nashville). The largest single-game crowd to witness a game at Principal Park was June 8, 2007 against the New Orleans Zephyrs. There were 15,188 fans on hand for the game and a post-game fireworks show. The franchise season attendance record was also set in 2007 when the Cubs drew 576,310 fans for the year. The largest crowd in Principal Park history was 18,158 on September 25, 2009 when the Dave Matthews Band performed to a capacity crowd. In 2005, Principal Park became the host venue for the Iowa High School Athletic Association state baseball championship tournament. The agreement between the IHSAA and the Cubs currently runs through 2020. During the 2017 season, the Cubs welcomed the 13-millionth fan to the new Principal Park as 535,660 fans filled the seats throughout the year. The organization has averaged 486,988 fans per season since the ballpark opened in 1992. In 2018, Iowa will celebrate its 50th season of Triple-A baseball in Des Moines. The Iowa Oaks lived at the current ballpark site from 1969-81, before the organization re-braded to become the Cubs in 1982 and has remained ever since.